I have nothing to add to the predictable chorus of boos and demands for resignation that have greeted the Archdruid of Canterbury's - how shall I put this sensitively? - somewhat naive comment that the introduction of Sharia law for Muslims in Britain was "inevitable", desirable, and would help "community cohesion". Or that the law "needs to take account" of the fact that some Muslims might not relate to British legal principles. Too fatuous for words, so I won't waste many. Is he unaware, I wonder, that Muslim law permits polygamy, or that the testimony of women is worth half that of men, or that while a man can divorce a woman by saying "I divorce you" three times a woman has to convince a panel of reactionary old men in beards that all the "divinely-established" conditions have been met? Or that it is the most fundamental principle of our jurisprudence (albeit one not often honoured where politicians are concerned) that all are equal under the law? Or that a similar proposal in Canada was defeated as a result of overwhelming opposition, not from secular liberals, but from Muslim women, many of whom were refugees from countries where Sharia operates and had experienced it at first hand? I doubt it. He's not ignorant. Stupid, yes, in a way that only the highly intelligent can be, but not ignorant. So instead I'll just express my genuine sorrow that this once so promising leader has proved himself, yet again, such a booby. I don't believe in the God he believes in, but I welcomed his appointment unreservedly. Here (by stark contrast with his uninspiring predecessor) was a man of rare quality, a genuine scholar and intellectual with a complex and subtle understanding of the relationship between religion and society. He combined, I thought, a deep love of Christian history and ritual with an appreciation of the best aspects of popular culture. He was also widely believed to be a liberal, a supporter of women priests and in favour of challenging the church's deep-seated aversion to gay people. 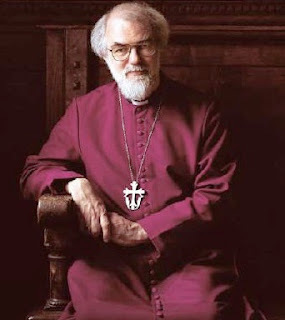 On the few occasions that I've met Rowan Williams, I always found him thoughtful, charming, good-natured and kind, if a little unworldly. As I have said, this is a delicate and complex matter involving what is mostly a fairly muted but nonetheless real debate among Muslim scholars in various contexts. I mention it partly because of its gravity as an issue in interfaith relations and in discussions of human rights and the treatment of minorities, partly to illustrate how the recognition of what I have been calling membership in different but overlapping sets of social relationship (what others have called 'multiple affiliations') can provide a framework for thinking about these neuralgic questions of the status of women and converts. "Neuralgic" here means, presumably, that it gives him a headache. He knows that, at a basic level, forced marriages and death sentences for apostasy are wrong. Yet such is his intellectual commitment to inter-faith relations and, perhaps, his friendships with prominent Muslim "faith leaders", that he can't quite bring himself to admit it. He prefers to speak in generalities and at the level of abstraction. But life does not take place on so elevated a plane. We are talking about real people who would be really affected by, for example, the decisions of a Sharia court in matters of divorce, child custody and inheritance. We are talking about communities in which power is overwhelmingly in the hand of male religious conservatives: to speak of "free consent" to Sharia in such cases is almost meaningless. A close reading of his lecture reveals that he does, to some extent, acknowledge these realities. But he doesn't seem to care: at least, not as much as he cares about being sensitive to the concerns of reactionary Muslim leaders. He could use his public platform to call for the release of the young Afghan journalist Sayid Pervez Kambaksh, under sentence of death for "blasphemously" downloading information about womens' rights. Instead he asserts that the Enlightenment principle of equality before the law is "not adequate to deal with the realities of complex societies". What is it with Williams and fundamentalist Islam? Does he envy the Muslims their apparent certainty, perhaps, given that his own faith is so compromised and unclear? Does he think that supporting the desire for sectarian religious law in this country will somehow lead to greater "respect" being given to all religion? Is it just traditional Anglican self-hatred? I don't know. It's puzzling. Puzzling and tragic. But the leader of the Church of England has ceased to speak either for the Church or for England. He should go. The man's a prat. An utter fool. He should go. I think you're right about the poor old geezer. He envies the purity and certainty of a religion that, for centuries, has been split into two major sects and myriad smaller ones that hate each others' guts. I actually don't understand what formal recognition of sharia courts would mean. That the UK fuzz would have to actually enforce their rulings? Or that there'd be a Muslim police force, funded by the filthy kafir state? All very odd. Nice to know you've actually read the speech before dumping all over it. The general view seems to be Williams wants to see stonings in the streets. The reaction has been totally hysterical. Anything to do with Islam brings out the knuckle-draggers. At least Williams tries to see two sides of a problem. He should certainly resign over this, though he looks to be digging in. If he won't jump, hopefully he'll be shoved. Did you hear the imam on the god-awful (and I use the word advisedly) Sunday programme on R4 explaining how he had tried to write a Muslim marriage contract to enable mosque marriages to be recognised? He has failed (so far, at least) because so many of his fellow imams wanted to include clauses stipulatiing that the witnesses should be men (or there should be four women, instead of two men) that the bride should not speak for herself but have a chaperone who answers for her (even the "I will" bit), and that polygamous (but not of course polyandrous) marriages should be permitted. If even a member of the faith cannot make a reasonable case for equating muslim marriage with the secular version, then that does not bode well. As Paxo said the other night, have we spent centuries weeding the religious biases out of our laws only to put some back in in the 21st century. 1) And a man just has to say "I divorce you" three times. 2) Divorce laws are a matter for public debate. If there was widespread demand for quicker divorce, then Parliament could legislate; but the law should apply equally to everyone. In any case, hasn't he heard of annulment? And 3) Why on earth would you want to get a divorce 3 days after marrying someone? Perhaps, I'm speculating here, because you didn't actually know the person you were getting married to, he was some cousin from a village in Pakistan twice your age you had been promised to since birth. "And a man just has to say "I divorce you" three times." I wonder how many wake up the next day going "Darling, I didn't mean it, I was just in a bad mood ..."